Description: Band M is a cool alternative to Cathedral and Whitehorse with a variety of high quality routes that are well worth the minimal effort required to find it. According to Joe Cote, "There is a common misconception that has been perpetuated in some guidebooks about the name of Band M Ledge. It was not a mistake, as some believe. 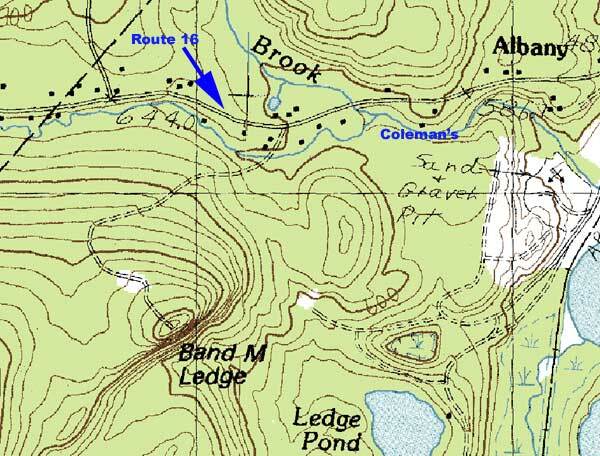 While it is true that there are AMC maps with "B and M Railroad" in close proximity to the ledge, the USGS 1958 topo for the Ossipee Lake quandrangle clearly identifies Band M Ledge, its sister Whitton Ledge, as well as the Boston and Maine RR"
Directions: Band M is located behind the Coleman gravel pits in Madison near the intersection of 16 and 113 just south of Conway Village. The 300' cliff is clearly visible from Rt. 113. NOTE: Access has been changed from the old guidebooks. It starts on Rt 16 near the Tanglewood Motel. Access uses private land so please respect the property owners' rights. Keep your noise to a minimum, especially near the parking area and DO NOT go "exploring" at the old quarry. Cross the stream on an old bridge and then take an immediate hard left. In a few feet you'll come to the Access Fund & Friends of the Ledges "Welcome Sign". Continue on the old logging road. After 3-4 min keep right and then pass an old car dashboard and boulders from the old quarry. This joins with the original approach trail from Rt 113. Bear right again, and soon the logging road drops downward to a flat area. To your right through the trees is the far right (north) end of the cliff. Continue up the logging road to the HUGE boulder. Here the middle of the cliff is to your right through the trees and boulders. 10-15 min. from the car. Click Here to see a Google Map. Copyright © 2019 All information presented on this web site is the property of NEClimbs and The White Mountain Report. All rights are strictly reserved. Climbing is a very dangerous sport. You can get hurt or even kill yourself. When you go climbing, you do so of your own free will. Everything on this site is to be taken with a grain of salt. Don't blame us if you get up some totally heinous route, in over your head and fall and hurt yourself.